This post was updated on October 18, 2017. Memory cards are one of those areas where photographers often try to save some money. While it may seem appealing to only spend $25 on a memory card instead of $80, how will you feel when you capture one of your best ever photos, only to find out that the memory card got corrupted and you've lost your data? However, you can also spend too much on a memory card. Spending $200 on a memory card is almost always a waste of money, because the newest specs for card speeds generally are not accessible by cameras for a few years. Camera speeds need to catch up to be able to address the fastest cards. Similarly, the highest size cards (such as 256gb cards or 512gb cards) simply cost too much and few photographers will fill that large of a card. The card I recommend and have in my camera most of the time is a Sandisk Extreme Pro 128gb card (available on Amazon.com). I'm not aware of any cameras from major manufacturers whose cameras can address more speed than this card can provide. It will keep you shooting fast, and I have always found Sandisk cards to be very reliable. A 128-gigabyte card will hold 4,266 large raw files (30 megabytes), so I doubt you'll fill the card in a full day of shooting unless you're shooting timelapse. I find that the highest risk of losing data is when you use two different memory cards in a single day. The chance of accidentally misplacing a full card in your bag, or overwriting the wrong card is too high. I like to have one single card that is big enough to handle everything I can shoot in one day, and then I offload that card all at once to a computer before switching cards. I used to recommend Lexar cards, but they have gotten out of the consumer memory card business and are just focusing on SSDs. There are 4 basic things you need to look for when purchasing your next memory card for your camera. When it comes to photography, you do not want to be buying just any memory card or the cheapest card memory card because you will most certainly be getting what you pay for. TYPE: DSLRs can accept either a Compact Flash (CF) or a Secure Digital (SD) cards to store your images. Higher end DSLRs will accept both types of cards to save the photos on. Anymore today, you will more commonly find just SD cards are accepted into the camera. 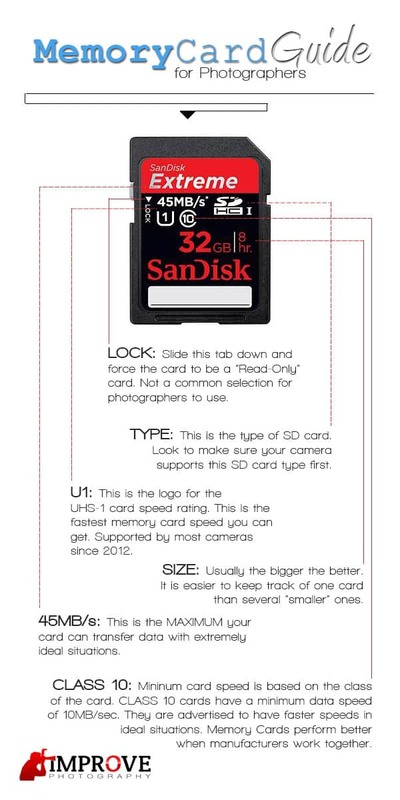 If you know your camera is older – but sure to read in your manual what type of SD card it supports. You have SDSC (SD Standard Capacity), SDHC (SD High Capacity), and SDXC (SD Extended Capacity). Most of the memory cards you find today will be the SDXC type and your camera must be compatible with this version of the technology in order to even recognize the card in the camera. You can tell what type of SD card it is by simply looking on the label – it is your camera that you want to look into more closely. SIZE: There can be a lot of debate on what is best for you when selecting the capacity of your next memory card. Evaluate your workflow and select a size that makes sense to you and your photography. Here at Improve Photography, we buy some of the bigger memory cards just so that we don't lose them and get them mixed up. We have a primary card we use in the camera with a backup memory card in every camera bag we have in case we forget the card in the computer or run out of memory on a long shoot. Consider looking at a 32GB card or greater when looking for your next memory card. SPEED: Memory cards have been rated based on a class system. A system that guaranteed a minimum file transfer speed between the device and the card itself. The highest class on a memory card is a Class 10, which means you have a guaranteed 10MB/sec. file transfer speed. But makers of the card will often advertise the maximum card speed should all conditions be ideal. However, the CLASS 10 we have all looked for has now been surpassed by the new UHS-1 (Ultra High Speed – 1) and are seeing data transfer speeds of up to 104MB/sec. These UHS-1 cards work best in native host devices, so look in your manual for your camera to see if it supports UHS-1… and if your camera was made in the last 1.5 years, then you should be good to go for this. BRAND: We highly recommend that you purchase a SanDisk or Lexar card from a reputable retailer. These two companies perform extensive testing to ensure that their product will work in as many products as possible without any error or corruption. The more affordable brands (such as Transcend) will skip the testing to save money on the overall cost of their product. They will work fine and you will find the same speed on them but whether or not they will last you for a while is something to be debated. Note: Be sure to buy your SanDisk or Lexar cards from a reputable retailer that you know or have heard of. 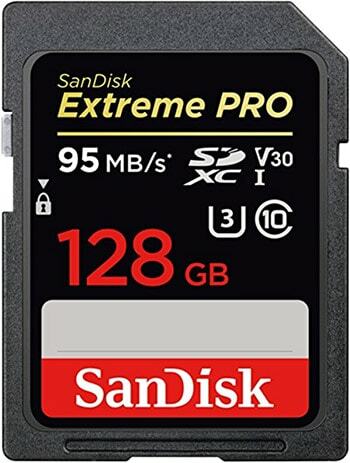 Because these are popular brands, it is easy for someone to sell you a knock-off version of the card by simply slapping on a sticker and calling it a SanDisk or Lexar memory card. So beware, even if you are buying on Amazon. Love these reviews and the whole website guys. i’m pretty new to your podcast and website but i’m doing my best to catch up ! It not only helps beginners but also excellent for professionals too. When it comes to improving photography and gaming, it is important to have the right SDHC memory card. Many different types of memory cards are available for camera but if you want to improve your photography, then it should be must to choose the right memory card for your camera. Any thoughts or preferences regarding SD card readers? I’m a relatively low-volume amateur photographer. Any thoughts about a good SD card reader for a relatively low volume amateur shooter? Most new cameras still don’t have any UHS support at all. UHS-I and UHS-II aren’t speed classes of cards. The former (UHS-I) is a faster bus interface clockspeed. UHS-II adds an extra row of contacts to the card and device along with the faster bus clockspeed. “U3″ (30MB/s) and “U1″ (10MB/s) are write speed classes of UHS cards. My new UHS-I U3 card could be slower in my non-UHS Sony A58 than some other non-UHS-I class 10 card. Of course you are right. There is a serious limitations in the card slot implemented in most camera bodies that limits the speed the SD card will be written to (which is what photographers really care about) no matter how fast the SD card is rated to be by the manufacturer. A slightly more expensive UHS-2 (written UHS-II) will have no effect in a UHS-1 card slot. In fact, even though a UHS-2 card is rated faster than a UHS-1 card, it could end up being slower than a UHS-1 card because the card slot in the camera body can’t use the second set of pins to get the UHS-2 speed. Still, at some point you may rent or purchase a camera that has an updated card slot, so I like having cards that are “future-proofed.” There usually isn’t a big enough price difference for it to matter a lot. I also buy them when the go on sale at Amazon, making the price difference not an issue at all. Finally, after researching a number of independent tests I recommend SanDisk Extreme Pro as being real-world tested as close to the top. Thanks for the tip to watch out for knock off cards! Jim, what is the memory card that you mentioned in the podcast that is basically a re branded SanDisk card? Bought 2 Sandisk ExtremeIII 8GB from Amazon in 2010 for a vacation to Norway. Got about 200 pics then the next 200 were corrupted then some more good ones at the end. Changed cards when I saw what happened. Same thing happened on the second card. Lost a third of my pics. Sent one card to a data recovery place to no avail. What about micro sbhd cards with adapter? I’ve had two failures with SanDisk Pro. One was a card fail, one was my fault. I shot full time for a government agency for a decade, and we used SanDisk all the time. Stories abound on the internet about how cameras recovered from water with SanDisk cards are still viable, etc. We shot in all weather (eastern Canada, so varies from very hot and humid to crackling cold). I had always been impressed, but I had never dropped one in water or really tested it. Anyways, as I moved on and began putting together my own pro setup of kit for photography, I bought SanDisk religiously. Last year, north of the Arctic Circle in Finland, I was there to shoot the northern lights. I brought a 32G card for each day I was going to be there, along with a few back ups. On day two, a mild day only -5C, my SanDisk (one year old card, stored in a weatherproof card holder when not in use) just pooched while we were on a hill walk. I didn’t have a spare on me, so I lost that morning’s shots. My fault for not having a spare. Basically, the card just gave an error message reading, “Cannot record to device.” It had been properly formatted, and just failed in a remote locale at a critical time. It has never worked since and the store took it back as a bad card. Second fail was my fault; I was shooting at a national park and while doing timed exposures of a river at the river’s edge, I had to change out the card and I butterfingered it and it rolled gracefully a few feet down the river bank and sploosh, into the creek. It was in the water for about 5-7 seconds. Literally, a few seconds. I got it out, tapped the water out gently, and left it to passively air dry back in my Pelican case in the rental car. In a hotel, I later used compressed air to gently try and dry it out further, as well as putting it in a paper bag of rice for a few days. Using recovery software, I was able to recover long-since formatted images from a wedding and from wildlife photography last year. My recent images, the once in a lifetime ones from the national park I traveled 5000 kilometers to visit? Gone. So, I heard from an insider that SanDisk might take my card and try and do a bit of black magic on it at their lab. I wrote in to the company, an honest appeal and explanation of what happened, how vital the images were, how I had easily provisioned myself with thousands of dollars of SanDisk cards in the past years, and had always advised my students to buy SanDisk, etc. I got a very corporate blow-off saying that their warranty didn’t honor user error and I could buy recovery software if I liked. Just felt like a corporate GFY. I know it was my fault dropping it, but a long time client who has bought mountains of their product, even after a critical fail last year, I just hoped for better than a finger point to the least expensive recovery software. Lexar for me it is now. I like Memory gear love all this facility. I recently heard there is an SD card that is now available that gives any DSLR the ability to transfer images to a cell phone (via an app) so they can be immediately sent to Facebook, etc. Have you heard of this? Opinion on quality? First off, SD cards are inexpensive now, especially compared to 10+ years ago. I have had issues with Sandisk, Lexar and Transcend. I find that after 2 or 3 formats in camera, I keep getting messages that the camera can’t read card. Sometimes these cards are only months old. I really have been disappointed with Lexar. But I have found a brand that makes really good cards and been using them for about 3 years. Samsung SD cards are really excellent. No problem cards. I have them in many different devices and no issues. They were pricey, but have come down. Amazon has periodic specials on Samsung cards. I buy at least 3 or 4 at a time. My new thing is using a card/s for a trip or event, then downloading the pics. I then put the card away for safekeeping. Not formating and reusing the card. Since I can buy a whole trip’s cards for less than $100, why keep reusing cards? I do not understand folks on here who are pros, pro-thusiasts who do not constantly change cards. Come on, SD cards are cheap compared to losing work, etc. Can anyone recommend a good XQD card for a D500? I have a Lexar card currently which has been really good but I want to get some more. Any suggestions?